Also, do you have a copy of the official workshop manual to spare? Wouldn't a lot of problems be solved by manufacturers putting something in place where the cars trip computers actually tell you that it is performing a Regen and when it is complete etc and when it is needed. ie like Error DPF at 40% please drive above 2k RPM for more than 20mins. Then a countdown to completion? Just so drivers have an idea what the hell is going on. I have a 2.2 Sport 2011 and have no idea when it does this. I notice my car runs on slightly after releasing the throttle whilst an active regen is in action. Makes the car feel like its not responding to letting off of the throttle. Watch the instantaneous consumption too, it will hold out in the 60-70mpg range rather than 99.9mpg. Whilst off of the throttle for a few seconds. Kinda new on here, as i have recently purchased a superb 08 Mazda 6 estate Sport 2.0 d ? All good..until the DPF started flashing and car went into limp mode..
My question: Has anyone recently removed the dpf and had no troubles with mot? If so i would appreciate if you know a garage that does it in Edinburgh. If you are lucky, it has not been reset for while and that is why it went on limp mode. If it was not flashing and suddenly came on and went in limp mode, then it may not be a reset problem. Change the oil and the oil filter if you have no trace of history. If you remove the DPF/EGR, the car will be illegal but you can always find an MOT centre to turn a blind eye with that. In general, you do not need to remove the DPF/EGR but you have to replace the oil from time to time and reset the service interval. Keep in mind that the DPF/EGR removal will cost you more than the value of the car. Somebody else had that. He managed to reset EML and start the regeneration. This did not happen in one go. While the regeneration was happening, the EML would kick in and stop it. So a new reset and a fresh regeneration. This happened several times but at the end worked. If the car drives, I would just drive it without stopping, i.e. no traffic lights route. Sooner or later, it will regenerate. Part exchange it with a petrol one and go for trips with the money you will need to pay to the exhaust butcher and the wannabe ECU brogrammer. Unless you have a friendly corrupt MOT garage that can let it go through and you cannot care any less about anybody else. To make the DPF happy you need to drive with at least 9mph, not driving less than 10 minutes and not idle for long time. All that is so easy to achieve and if you cannot, you should rethink whether you really need any type of car. MOT examiners are now specifically looking out for DPF removal in which case an automatic fail. The crud out of the exhaust will be the giveaway. 2007 mazda 6 2.0 diesel. Since stripping and cleaning the EGR valve stem and carbon scaper gauss 18 months ago I have not had any problems. I do occasionally monitor the regen with forscan software to give me confidence that all is well. I would like to emphasise to clean that valve if you are having problems with dpf. What is the carbon scaper gauss? Do you have any photos from the EGR cleaning? Removing, etc? After having the dreaded DPF problem on my Mazda 6 2005 - 2007 I was unable to find any decent how to guide on how to sort this problem. In my case I have the DPF light flashing, Engine management light on and for some reason the traction control light was on. The car was in limp mode with no power at all. There are plenty of companies offering DPF removal and delete etc but with the tougher rules with the MOT this is obviously no longer an option. I'm pretty handy with the spanners but the whole process is relatively easy and can be completed by anyone who has basic DIY mechanical skills. As you will be removing electrical connectors, disconnect the battery for safely purposes. Next jack the car up as high as you can, obviously support the car using axle stands etc and ensure the car is adequately supported. Essentially you are just removing the exhaust, but the DPF has several sensors and some fuel pipes connected to it. We are now going to remove the sensor connectors. There a four of these, all are the clip type of connectors where you press in one side and pull it away, obviously take care when doing this as you don't want to break the wires from the connectors. I also labeled each of the connectors with masking tape and marker pen to ensure I reconnected them in the correct order. Once these have been disconnected, follow the wires towards the DPF and you will see they go through two black clips that secure the to the underside of the car. These simply unclip using a flat screwdriver in the slot. Next we are going to remove DPF itself. Now on to the front fixings of the DPF. I used a trolley jack to take the weight of the DPF just to ensure it doesn't drop down as there is two fuel pipes attached to it. The DPF is connected to the downpipe with two sprung 14mm nuts again, plenty of penetrating fluid will help here.. On my car the studs came out, this was OK, just a pain to reassemble. Once these are removed, the DPF should be free bit you will need to remove the two fuel pipes. You will need pliers to squeeze the pipe clips to move them off the fuel pipe, once they are off the pipes simply pull off. Again I marked these with my tape and marker to ensure they went back on correctly. Also make sure you don't lose the small pipe clips. The DPF is connected to the rear sections by a single exhaust clamp. However after years of heat and corrosion the clamp was well and truly seized in place as was the joint so I found it much easier to remove the whole exhaust. If you need to do this as I did you will need to remove another two exhaust rubber mounts which are located towards the rear of the DPF section. There is also two further rubber exhaust mounts located either side of the back box. The Jack that is supporting the front section can now be lowered and the exhaust including DPF should be free from the car and you will be able to pull it out from the rear of the car. You will need to separate the rear section from the DPF, mine was well and truly seized together and no matter what I did it just wouldn't separate. I had no other option but but to cut a small channel down the rear pipe part in order to free the two parts, there is a small channel already there with a small locating lug on the DPF section of pipe to ensure when you reassemble it goes together correctly. I used a product called Wynne's 18985 off car DPF cleaner. This was purchased from eBay for just under £30. I went for this particular cleaner as the reviews were good, there are other products on the market but I can't comment on how effective they are. To clean the DPF you firstly need to remove the sensors connected, again the penetrating fluid will be your friend here. I had to leave one in place as it was just to tight and I didn't want to risk damaging it. I don't know if this will have any long term effects but I am hoping it won't! Again I marked where all sensors and the holes they came from. I used latex gloves however, these didn't seem to be man enough for the job, it leaked quite alot and needed resealing so maybe marigolds or something like that may be better - I will call these glove seals now so you can follow the rest of this guide. Once you are satisfied all areas the DPF cleaner could escape from has been sealed face the pipe you have not sealed in the air. I used a set of step ladders and hooked the mount where the rubbers connect to the car to hold the pipe upright. Double check you have not damaged any of your glove seals while doing this. Then pour in the contents of your DPF cleaner. The bottle says leave for at least 90 - 120 minutes but I left mine overnight for around 8 hours, agitating the whole unit from time to time. Make a hole in your glove seal to allow the liquid to drain out. Once it is empty, remove all of your glove seals. Then pour 2 - 3 kettles full of boiling water down the end of the pipe you poured the cleaning fluid. You will notice that it flows slowly for the first few seconds the you will really see it clearing. As I still had it hooked on the step ladder, I was able to point a hose pipe down the same end of the pipe. I did this for a couple of minutes until the water ran clear. Give it a good flush through with the water and use a soft brush to remove any left over ash you can't get to with water alone. Once you feel you have removed as much as you can give it a little rinse from the other end again to ensure nothing remains. I left mine in the sun for a few hours to dry out thoroughly before refitting. As I took it off as one piece I refitted as one piece. Refit all sensors that have been removed. Reconnect the DPF section to the rear section. There is a small locating lug on the DPF section and a small channel on the rear section. Make sure these line up correctly as the exhaust will not fit back on the car if you don't! As I had to cut an extra small channel to remove the two sections I fitted an exhaust sleeve from GSF to ensure a good connection. Refitting to the car is basically the reverse of removal. Slide the whole unit back under the car from the rear. Reconnect the back box rubber mounts. Place the small pipe clips over the fuel pipes on the DPF then raise the trolley jack up enough for you to be able to reconnect the fuel pipes to the DPF and secure the clips. refit the front of the DPF pipe to the down pipe. If like me your studs came out you can either replace them with new ones, try to separate them with a socket and mole grips or just spend ages underneath the car and eventually getting them back in not forgeting the springs. Then refit the front exhaust mounts and support bar. Refit the final two rubber exhaust mounts. Reconnect the four connectors and secure the wires into the two black clips. Take a few minutes to admire how clever you are as you have just saved a fortune on a brand new DPF! 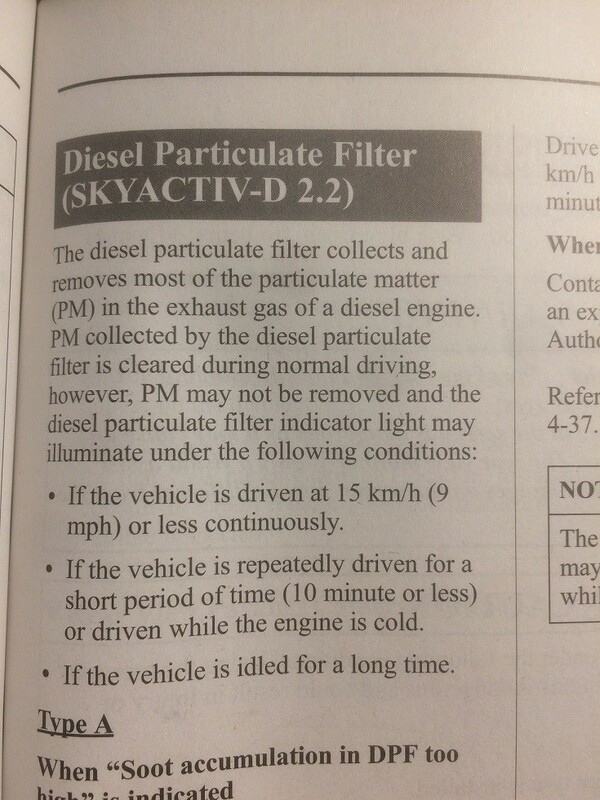 If you had the DPF warning lights on you dashboard, your car will no doubt still think that your DPF filter is blocked. If you have Mazda or another decent diagnostic software that deals with DPF you can reset the ECU this way. Alternatively you can force a DPF regeneration. There is a cheat method on the Mazda 6 to do various maintenance options. For this particular procedure you will need to run the engine until it has warmed up to at least 70 degrees. Then connect a jumper wire from the negative terminal to the service pin. Then start the engine and press the accelerator pedal two times. If you have done it correctly You will notice the revs go up to around 1800 rpm. Mine took 46 minutes and the revs dropped, the light went out, came out of limp mode and full power was restored. The link below will show you where the service pin is and various other options you can do. Credit to the author for creating this webpage. I hope this guide will be of some help to others out there. The job isn't nearly as daunting as garages etc make it sound and only cost me around £40 all in for the exhaust clamp and cleaning fluid, when searching myself people were saying they had to scrap their car because of DPF filters being blocked. In hindsight I should have taken pictures but I have tried my best to describe everything I did. Another thing I noticed was the cleaning fluid smells exactly like oven pride? Not sure if the chemical used is the same? Only difference I know for sure is the DPF cleaner has the consistency of water whereas oven pride is more of a gel. Link to service pin location and cheat guide. the DPF has several sensors and some fuel pipes connected to it. FYI the black rubber pipes are for the differential pressure sensor, they're not fuel pipes. Hello everybody. I'm new to this forum and new to Mazda. Recently bought 2014 Mazda 6, Estate, Sport Nav, 2.2 diesel. engine code is SH if I'm not wrong. Car has done 70k miles so far. Few days after picking it up from the dealer I noticed slight engine hesitation when cruising at around 1500rpm, and one day when stopped traffic lights, engine started knocking at idle and stalled. After restarting it, it would knock at idle and went normal at higher revs. I took it to Mazda for diagnostics and they advised it's carbon buid up in the engine and possible turbo fault however I was suspicious and took it to independent garage who, after checking car, said they don't see anything wrong with it and definitely can't see what is wrong with the turbo. How odd I thought. So after picking car up from them I drove for a day or too, all fine and car started playing up again. I realised it was hesitating when dpf regen started. I did one of those carbon cleaning services and I must admit car feels smoother but when it does dpf regen and I stop at traffic lights I can see revs going up and down and if I drop from high revs to low quickly I can hear loud knocking coming out from it for few moments. I'll mention that after carbon cleaning car doesn't stutter at around 1500rpm like it used to. Now I know that dpf regeneration takes place every 70/80 miles which is about half of what these cars should do from what I read on this and other forums. Does anyone know what to do and where to start to get down to the bottom of this issue? Or do I just try and get rid of this car? Page created in 0.271 seconds with 21 queries.